Six channel audio (AC coupled ) mixer, channels arranged in three groups with separate outputs having led indicators. Each group can be switched to mix with the subsequent group, allowing for 2-2-2, 4-2, 6 mix configurations. 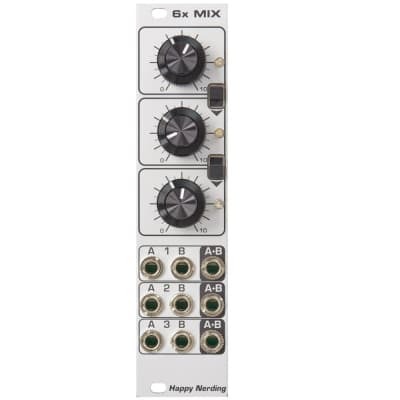 The module can also be used to mix two stereo channels plus separate group of two mono channels. Perfect audio performance with the lowest noise and distortion amounts. The inner knobs control the A inputs, while the outer knobs control the B inputs. This Module is currently available.